So I have been very negligent of this lil blog, which I guess can be seen as a good thing since we've been so busy with our fantastic customers! One of the things that has been keeping us busy is working with an amazing team of vendors to collaborate on this classically modern styled shoot. For the flowers we worked a rich pallet of burgundys, blues, and whites. This shoot's feel was perfect for the mix of peonies, roses, anemones, scabiosa, eryngium, brunia berries, dusty miller, and ivanhoe. A huge shout out to all the vendors that lent their talents, products, and time! Decor - Ashley & Co. Hair and Makeup - Blush & Glow Co.
We've had such a wonderful array of brides and their flower choices so far this spring, and it's been such a blast. I'm forever grateful that I get to share my love of flowers and creating with each bride, so check out our lovely collection of memories. As evident by the date on our last blog post it may seem I've been slacking, but in fact we've just been wonderfully busy! I wanted to thank all of our beautiful brides and fantastic customers for providing us with the opportunity to work all of their wonderful events. 2017 will hold some gorgeous items for us, and I can't wait to share them with you!! So since I'm in a giving mood, check out some eye catching work that we did at the end of last year! Hope you enjoyed looking at all these beauties! It's amazing how each creation reflects the one it's for, and I'm looking forward to creating even more unique pieces in 2017. 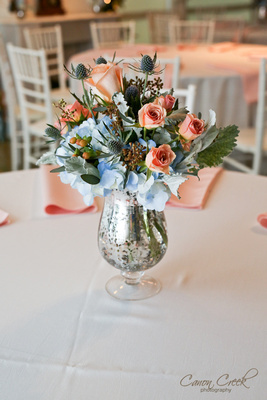 The centerpieces were plentiful at this elegant quinceanera! Hydrangeas, coral roses, and led lights made for the perfect combination. The pictures on this one pretty much speak for themselves! Rain, Rain but not today! It's been unusually rainy this time of year and thankfully it let up for a lovely wedding that took place at 7F Lodge in College Station, TX. This wedding mixed tones of purple, rustic wood, and glamorous gold, which lead to one gorgeous outcome. 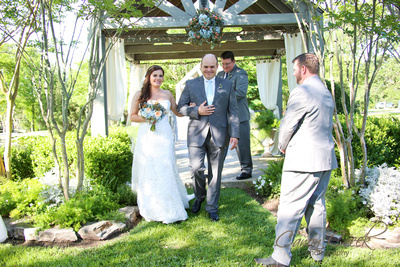 Another April wedding for the books, and this one was the definition of country chic! 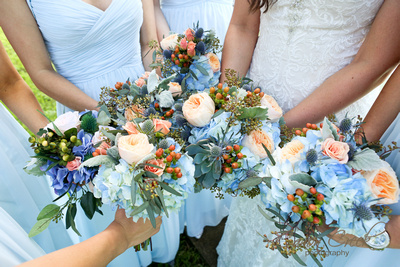 A perfect mix of blue and peach flowers melded with boots, mercury glass, and wonderful outdoor ceremony with a hint of succulents thrown in here & there. 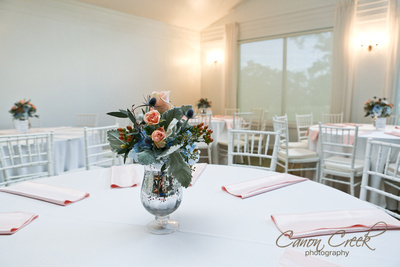 The flowers gave that hint of wildflower country with the added class of garden roses and it worked perfectly! Hydrangeas, Juliet garden roses, eryngium, hypericum, seeded eucalyptus, and a few succulents made for an unforgettable combo. 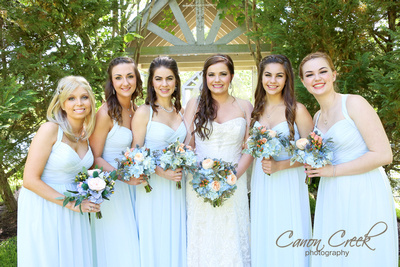 A huge thanks goes out to ﻿Canon Creek Photography ﻿for the wonderful pictures of Michelle and Jess's big day!! It's April and the wedding season rush has begun. 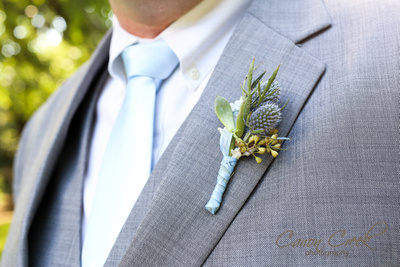 Here's a little sneak peak of two wonderful weddings we did this past weekend. The first was a mix of coral and whites made with Nature's Cherry Roses, hydrangeas, and waxflower. Followed by a wedding filled with blush and burgundy flowers. The Geraldine roses mixed perfectly with burgundy ranunculus to give that romantic chic feel! Everything is ready & now it's time to pack it up! Nature's Cherry, Juliet Garden rose, hydrangeas, & waxflower!! How can you not love this mix. The tall and short of it!! 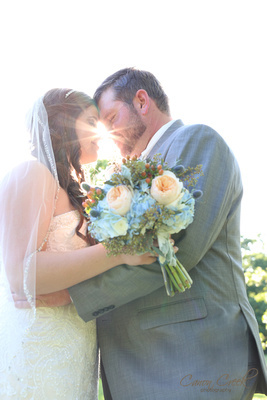 Doesn't this bridal bqt just have it all! Garden roses, dahlias, ranunculus, wax, & seeded eucalyptus. Boxes & boxes of flowers ready to be taken to the venue! These Geraldine roses look wonderful on the cake, don't you think!! A mix of different bottles and the little gold dinos make this set up one of a kind! ﻿It has been far too long since I posted a blog, and what a better reason then a delightful December wedding! The wonderful wedding was the uniting of Lia & Cameron with the fantastic Jen Shu from Pink Light Images capturing each memory filled moment. 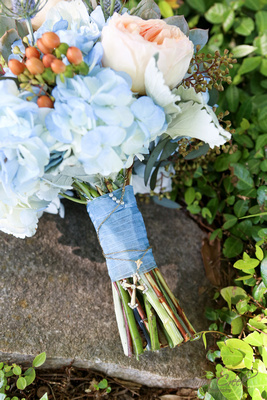 Garden roses, hydrangeas, lamb's ear, baby's breath, birch, silver, gold, and cedar made this wedding one for the books! 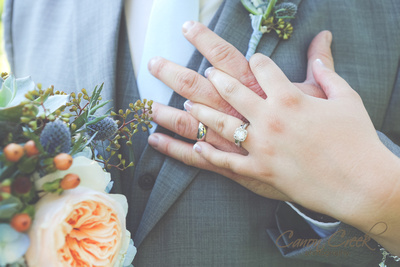 It is always wonderful when we have the chance to receive professional photos from the weddings we work, and here are a few from one this past October from Dreamy Elk Photography. 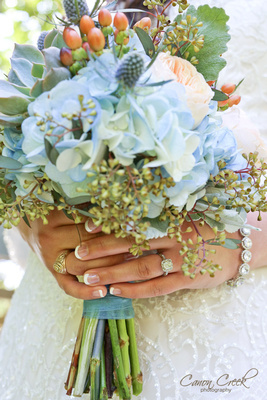 For this wedding the bride choose to got with beautiful bold colors for her bouquet and simple white for her girls. 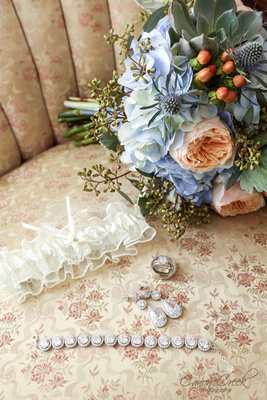 If you're on a budget it's always great to get exactly what you love for your bridal bouquet and simple for you girls. Picking one type of flower, be it in one or multiple colors, is a great way to get a classic look without spending a fortune. One great little gem in this wedding was the fact that we wove a piece of lace from the mother's wedding dress onto her daughter's bouquet, along with a family necklace. Sometimes it's all in the details, and the details can make all the difference. A huge thank you to Dreamy Elk Photography for the wonderful photos!! For more of her her work check out her blog.